Disaster Epidemiology: Methods and Applications applies the core methods of epidemiological research and practice to the assessment of the short- and long-term health effects of disasters. The persistent movement of people and economic development to regions vulnerable to natural disasters, as well as new vulnerabilities related to environmental, technological, and terrorism incidents, means that in spite of large global efforts to reduce the impacts and costs of disasters, average annual expenditures to fund rebuilding from catastrophic losses is rising faster than either population or the gross world product. Improving the resilience of individuals and communities to these natural and technological disasters, climate change, and other natural and manmade stressors is one of the grand challenges of the 21st century. 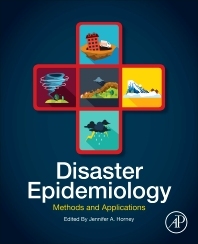 This book provides a guide to disaster epidemiology methods, supported with applications from practice. It helps researchers, public health practitioners, and governmental policy makers to better quantify the impacts of disaster on the health of individuals and communities to enhance resilience to future disasters. Disaster Epidemiology: Methods and Applications explains how public health surveillance, rapid assessments, and other epidemiologic studies can be conducted in the post-disaster setting to prevent injury, illness, or death; provide accurate and timely information for decisions makers; and improve prevention and mitigation strategies for future disasters. These methods can also be applied to the study of other types of public health emergencies, such as infectious outbreaks, emerging and re-emerging diseases, and refugee health. This book gives both the public health practitioner and researcher the tools they need to conduct epidemiological studies in a disaster setting and can be used as a reference or as part of a course. Jennifer A. Horney, PhD, MPH is an associate professor of Epidemiology and Biostatistics at the Texas A&M University School of Public Health, a faculty fellow of the Hazard Reduction and Recovery Center at the Texas A&M College of Architecture, and the public health and environment lead of the Institute for Sustainable Communities, part of the University’s Environmental Grand Challenge. At Texas A&M, Dr. Horney’s research focuses on measuring the health impacts of disasters, as well as the linkages between disaster planning and household actions related to preparedness, response, and recovery. Dr. Horney received her PhD and MPH from the University of North Carolina at Chapel Hill, where her research focused on the role of social factors in decision making during disasters. She serves as a member of the Council of State and Territorial Epidemiologists’ State and Territorial Epidemiologists’ Disaster Epidemiology Community of Practice and was a member of a team of public health practitioners who responded to Hurricanes Isabel, Charley, Katrina, Wilma, and Irene, where she conducted rapid assessments of disaster impact on the public health of individuals and communities. She has also provided technical assistance to public health agencies globally around disasters, infectious disease outbreaks and pandemic influenza planning and response. The Disaster Epidemiology textbook is a giant leap forward for the field of Disaster Epidemiology. It is comprehensive and provides excelled case studies for students. I am excited to implement the use of this textbook into my courses next year!